For over fifty years, Kiehl’s chemists have identified the unique requirements and challenges of men’s skin. 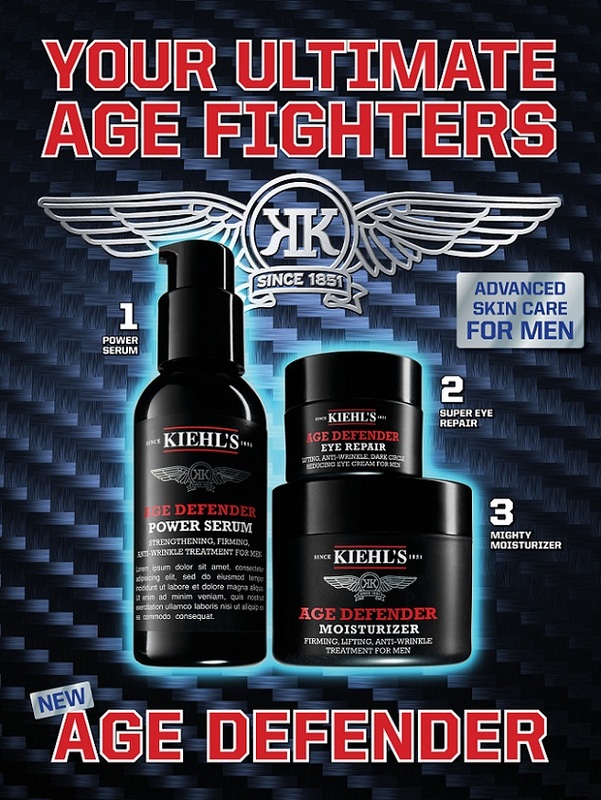 It is with this legacy that Kiehl’s introduces Age Defender for Men. This simple yet effective trio includes a serum, moisturizer and eye cream to help protect men’s skin from the rapid onset of the signs of aging. The collection’s star product is the Age Defender Power Serum, which represents Kiehl’s first-ever serum architecture for men. It is an ultra-light, yet highly effective formula that absorbs easily into the skin and features Cypress Extract, Hydrolyzed Proteins and Adenosine, to help visibly firm sagging skin and reduce the appearance of wrinkles for a more youthful, resilient appearance. In a clinical test, the serum was demonstrated to improve nasolabial wrinkles by 15%, and skin radiance by nearly 14% after 8 weeks of use. In consumer testing, 94% reported an improvement in the appearance of skin texture after 2 weeks and nearly 93% agreed their skin appeared more resilient and elastic after 8 weeks of product use. Then the Age Defender Moisturizer utilizes dual-action technology to exfoliate skin while delivering the potency of vitamin-rich Linseed Extract. It reinforces the actives in the Power Serum and improves the elasticity and firmness of skin. And the collection’s Eye Repair formula, featuring Rye Seed Extract, instantly brightens the appearance of dark circles, as well as smooths and firms skin to improve the appearance of crow’s feet and under eye bags to complete the regimen. This collection works to strengthen and visibly firm skin, plus minimize the appearance of fine lines & wrinkles to reveal more resilient, energized and youthful looking complexion within a simple anti-aging regimen.